This is my last show of the year, and it's a group event, so expect lots of great art to enjoy if you decide to come out and visit me. I'll have Squiggles and chains and a mix of my regular work in addition to the one-offs ~ and everything will be at the old prices from before silver skyrocketed above $25 an ounce. (I just checked and it's $28.70 right now. If you're interested, check Kitco for the live silver spot price.) Unfortunately, my prices will be going up to better reflect the market the next time I order silver, which will be soon. 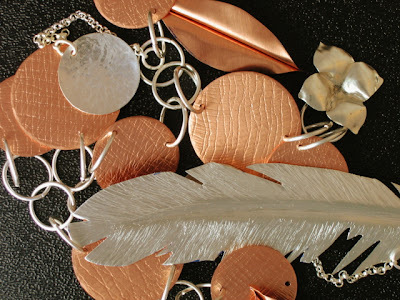 Good news: You can now shop for Tin Cup Designs jewelry at Annie Kaill's in Juneau and Flypaper in Anchorage. And soon I'll be adding Gold Rush Fine Jewelry in Fairbanks to the list. More to come in the new year. I loved that necklace, too, and am so happy it went to live with someone who will love it just as much. There will never be another one just like it, just as no two leaves are ever alike. But if you like real leaves imprinted forever into metal and would like for me to make something for you, all you have to do is get in touch. I love working with the leaves: Always a surprise, and the surprise is always good.